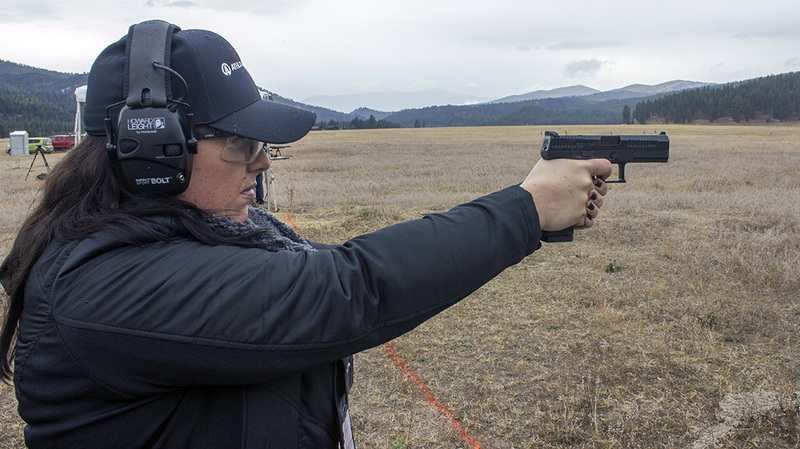 With two new additions to the CZ P-10 pistol line, the company is letting it be known that they are coming for the striker-fired pistol market. 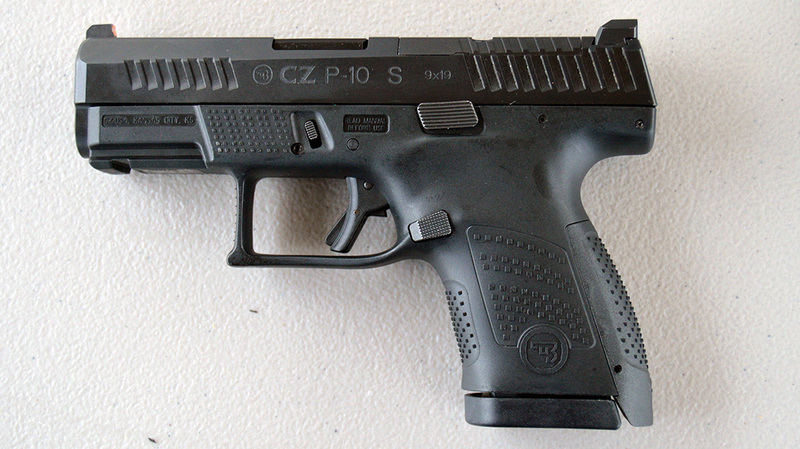 One of the pistols that excited me most during the past couple of years was the CZ P-10 pistol. 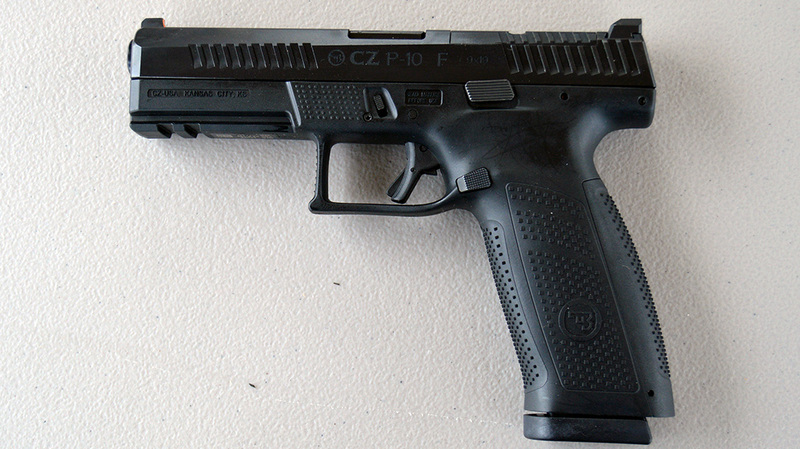 This compact, polymer-framed, striker-fired pistol has approximately the same size and profile of the G19. CZ shot across other manufacturers’ bows to show it was coming for a piece of the striker-fired market. And CZ wasn’t bashful with its approach. Most of the time, when a company introduces a line of pistols of varying sizes, the full-size model is introduced first. After that, manufacturers aim at different market sectors by releasing compact and sub-compact versions as well. 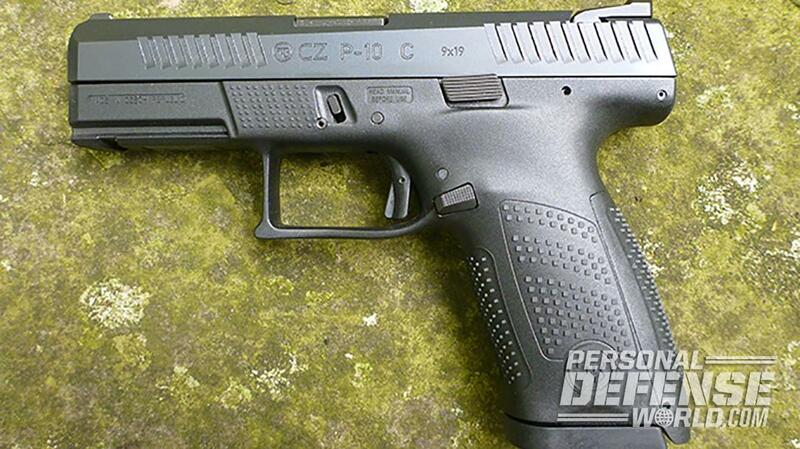 CZ flipped the script on that process by releasing the compact version of the CZ P-10 pistol. Offering up the P-10 C first had a couple of immediate benefits. It let the market know that CZ was serious about the striker-fired market by pushing the notion that the P-10 C would fit most G19 holsters. The company’s tongue-in-cheek slogan of “Improving on Perfection” poured some fuel on that fire as well. The second benefit was that the P-10 C would fit the needs of a wide spectrum of users. 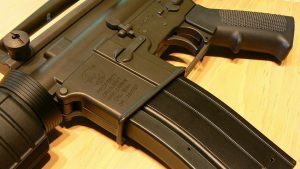 It could be selected by militaries or law enforcement agencies as a service weapon, but it could also serve equally as a concealed carry weapon for civilians. In early October, a bunch of content creators gathered at the 2018 Athlon Outdoors Rendezvous to see some of the latest wares from different manufacturers. The CZ folks were just waiting for me with big grins on their faces. They knew what I was looking for and they had delivered. 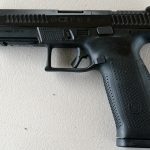 On the table were a couple of new models for 2019: full size and sub-compact models of the CZ P-10 pistol. 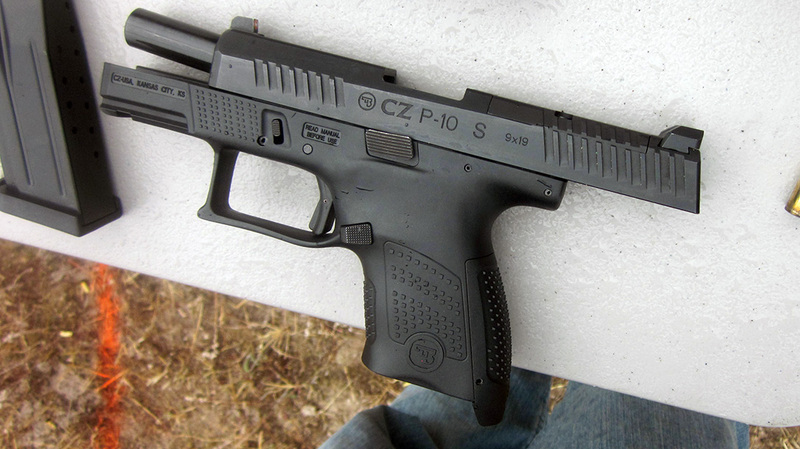 Acting as bookends dropped simultaneously on either side of the P-10 C, CZ introduced the P-10 F and P-10 S to address the different needs of various users. 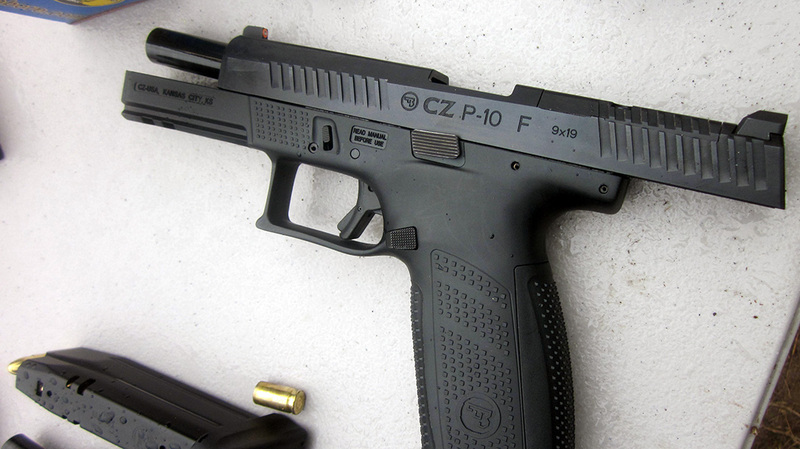 While the P-10 C acts a versatile, do-it-all model, CZ tailored the new variants for specific use cases. And though the new models retain the features of the P-10 C, CZ took the extra step by improving on a few features as well. The P-10 F is a lot of pistol, but it retains the sleek and slim lines of its predecessor and the great ergonomics as well. 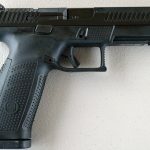 It has a 4.5-inch barrel versus the 4-inch barrel of the P-10 C. It also stocks more ammunition with a 19+1 capacity with the flush-fit magazines. 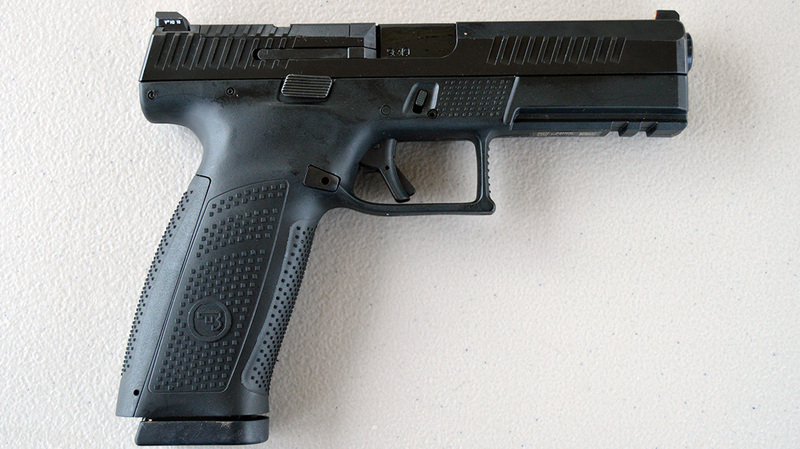 Conversely, the P-10 S houses 12+1 rounds in its sub-compact form. Also, the barrel length is just 3.5 inches — for when the P-10 C just isn’t quite small enough. 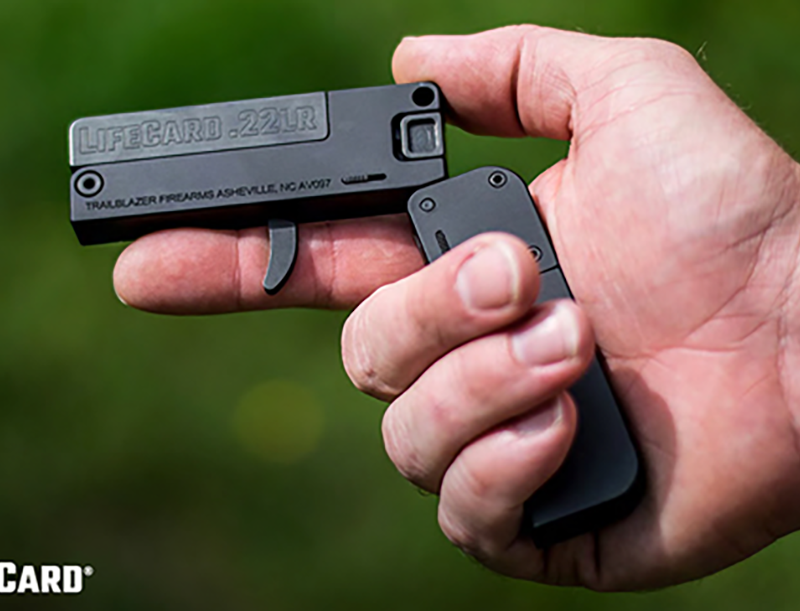 Like the P-10 C, the F and S models incorporate interchangeable grip inserts so users can adjust the fit to their hand. Also, they both sport an ambidextrous slide stop/release. However, rather than using an ambidextrous magazine release, the new models utilize a reversible mag release instead. This is the first improvement I noticed as it keeps the opposite side of the release from pressing into the inside of the user’s hand and fingers. This can slow down reloading for some users. The next improvement I noticed is that the trigger is noticeably better than what I have experienced with the P-10 C; and I have shot multiple copies over the last year or so. CZ made some minor tweaks and adjustments to the fire group across the entire line. It still has that excellent break and very short reset, but the pull is lighter. 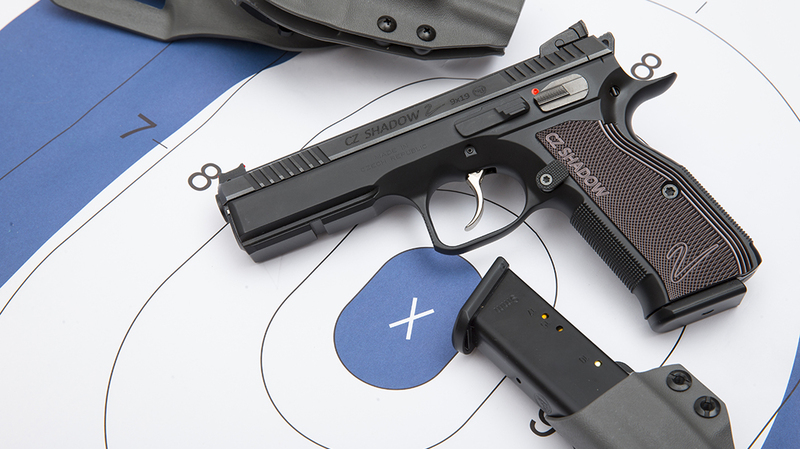 Another standout feature CZ included is a front night sight. Its orange halo makes it easier to pick up and track targets in low light. 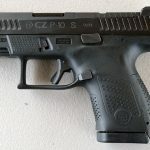 Originally, the P-10 C came with white, three-dot sights, but now CZ is including a serrated, black-out rear sight with the front night sight as standard equipment. Other than size and capacity, there really isn’t much else different about the new models. However, that’s a good thing. In fact, I didn’t notice much difference in the shooting experience. I shot the F and S models side-by-side and they had pretty much the same recoil and shooting characteristics as the P-10 C. There may have been just a hair more muzzle flip with the P-10 S, but it was negligible. The longer sight radius of the P-10 F provided more confidence in the sight picture, but I don’t know that it improved practical accuracy. Given the time constraints of the event, we weren’t able to test different loads for accuracy or do exhaustive reliability testing. That will come later when production units hit the street. But given my experience with multiple C models, I have no doubt that the performance of the new variants will be stellar as well. Something I noticed during my research is that CZ quietly updated its web page with the new ensemble of optics-ready pistols. 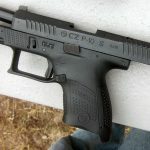 Not only is the P-10 C good to go, but CZ is offering optics-ready versions of the S and F models as well. The slides come pre-milled to allow users to install their preferred red-dot optic. Currently, the packages come with a blank slide plate for when an optic is not in use and two additional slide plates; one is for the Trijicon RMR and the other is for the Leupold DeltaPoint Pro. Additionally, the optics-ready models include higher sights for co-witnessing the irons through the optic’s window. 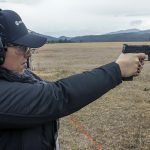 So, as things stand, it looks like CZ swung for the fences with the new models it’s bringing to the striker-fired pistol market. From the casual shooter to the veteran warrior and the concealed carrier to the home defender, CZ has the bases covered. You can go small, medium or large. You can also rock them with or without a reflex optic. The only thing I can conclude from this plethora of new offerings is that CZ is serious, and it’s just getting started. 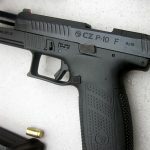 For more information about the CZ P-10 pistol, please visit CZ-usa.com. Weight: 28.2 ozs. ; S model 24.4 ozs.